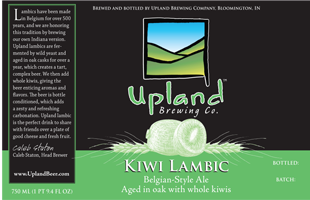 The next installment of Upland fruited lambics are finally ready to hit the streets, featuring Kiwi, Strawberry and Blackberry for your palate’s sour pleasure. A lottery system is still in effect these days (RIP online reservation system), similar to previous releases of Upland Sour Reserve, in order to distribute the highly limited lambics with as little chaos as possible. Start petting that lucky rabbit’s foot – you’re probably gonna need it. This entry was posted on September 24, 2013 by Nick. It was filed under Beery News and was tagged with craft beer, fruit lambic, lambic, Upland Blackberry Lambic, Upland Brewing Co, Upland Kiwi Lambic, Upland Lambic, Upland Sour lottery, Upland Sour Reserve, Upland Strawberry Lambic, wild ale. Please, please, let us win a bottle!